Kurt Vile and Courtney released “Over Everything,” the steady new single from their collaborative LP, Lotta Sea Lice, out October 13th via Matador. In the black-and-white clip, the indie rockers sing straight into the camera while strumming their Fender electric guitars in a series of locales – a beach, city bridge and country field. With its ragged wall of guitars, deadpan vocal delivery and stream-of-conscious lyrics, “Over Everything” sounds like a natural meeting point between the singer-songwriters’ respective styles. The duo will promote the LP with a tour launching October 11th in San Diego, California and concluding November 11th in Austin, Texas. The jaunt will feature a backing band of revolving members, the Sea Lice, including Janet Weiss (Sleater-Kinney), Stella Mozgawa (Warpaint), Rob Laakso (the Violators, Mice Parade) and Katie Harkin (touring member of Sleater-Kinney and Wild Beasts). 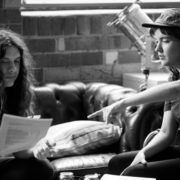 Vile and Barnett also detailed the album’s track list and revealed its collaborators, including Mozgawa, Australian music icon Mick Harvey (Nick Cave and the Bad Seeds, the Birthday Party) and the Dirty Three’s Mick Tuner and Jim White. The nine-track Lotta Sea Lice includes Vile’s cover of Barnett’s 2013 track “Outta the Woodwork” and Barnett’s take on Vile’s 2011 tune “Peeping Tomboy.” The album follows Vile’s 2015 solo LP, believe i’m goin down and Barnett’s debut from the same year, Sometimes I Sit and Think, Sometimes I Just Sit. 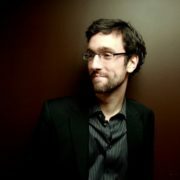 “Over Everything” initially sparked the pair’s collaboration, after Philadelphia-based Vile wrote the song with the Melbourne-based Barnett’s voice in mind. They soon began swapping material and realized their intended low-key “side-project” had blossomed into something more substantial. David effortlessly injects any song with his irresistible energy, which has led him to numerous collaborations – with a Latin Grammy winner to a world renowned opera diva to a Canadian hip hop star. His endearing live charm, coupled with an uplifting sense of humour, has gained David an increasingly large fan base, and afforded him frequent festival appearances. Hovering somewhere around a magic spot between James Taylor and Justin Timberlake, David’s diverse set of musical tools has garnered a staggering number of prestigious nominations and awards and numerous high profile music placements around the globe, from the US hit series “Parenthood”, to Australia’s popular “Packed to the Rafters”. This article originally appeared on Maple Music. 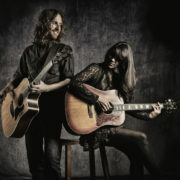 In mid-2011 Hawkes produced, performed and co-wrote with singer-songwriter Miranda Dawn for her debut album, Reason to Feel Alive with co-performances and production by Hawkes. The majority of performances, both duo and solo acoustic, were recorded live to demonstrate the natural life in her emotive songwriting. Dawn was recognized as a finalist in the Kerrville Folk Festival New Folk songwriting competition and performed with Hawkes at the festival in May 2012. Dawn and Hawkes continued co-writing and touring together. They released a collaborative effort, Golden Heart, in June 2012. The album features production with their full band and more stripped down live acoustic sound. In 2013, the duo auditioned for season 6 of the American reality talent show The Voice. Their audition was broadcast on NBC on February 24, 2014, on the inaugural episode of season 6 singing an acoustic version of The Beatles song “I’ve Just Seen a Face”. Two of the four judges, Adam Levine and Shakira pressed the “I Want You” button turning their chairs. “That was my favorite performance I have ever seen — ever — on ‘The Voice'” said Levine. After a brief consultation, they picked to be on Team Adam. Their iTunes single for “I’ve Just Seen A Face” climbed the chart hitting #1 in Rock sales and #22 across all genres. Their previously released “Golden Heart” EP followed, climbing to #2 in the singer/songwriter chart. This biography originally appeared on Last.fm. A colorful indie folk outfit based out of Los Angeles, California, Magic Giant’s effervescent blend of folk, pop, and rock invokes names like the Lumineers, Edward Sharpe & the Magnetic Zeros, and Mumford & Sons. 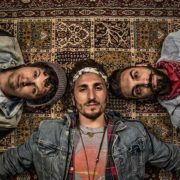 Founded in 2014 by multi-instrumentalists Austin Bisnow, Zambricki Li, and Brian Zaghi, the group issued its eponymous debut EP in 2015, and generated some heat with the single “Let It Burn,” which garnered praise from NPR, who called it “a summer festival anthem.” In 2016 the band toured hard, hit the festival circuit, and landed another viral hit with “Set on Fire.” That same year saw Magic Giant ink a deal with Razor & Tie, with plans to release their debut studio long-player in 2017. 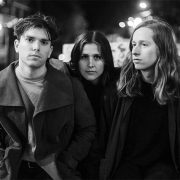 Sydney indie pop trio Middle Kids burst onto the scene off the back of their first single and a starry endorsement. Classically trained piano player Hannah Joy and multi-instrumentalist Tim Fitz first met in 2014, and Fitz began to produce her solo work as well as playing in her band. 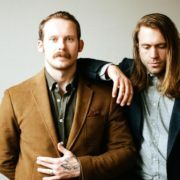 Following a series of Bandcamp solo releases for Joy, the pair recruited drummer and Sydney Conservatorium of Music in Jazz Performance graduate Harry Day to join them in 2016 as their songwriting became increasingly collaborative. Before they’d even played their first show, the newly formed trio set about recording their debut single, “Edge of Town.” They received an immediate boost to their profile after Elton John aired it on his Beats 1 radio show, added it to his playlist, and called himself a fan. They achieved further exposure when they won FBI Radio’s Northern Lights competition, which earned them a spot on the bill at the Iceland Airwaves Music Festival in Reykjavik. Keen to put out their first extended-play release, the trio gathered together tracks like “Doing It Right,” which was recorded at Parliament Studios along with “Edge of Town,” and a number of other compositions recorded in Joy and Fitz’s garage. Their self-titled six-track EP appeared in early 2017, and featured songs full of lo-fi charm matched with big pop hooks. Middle Kids were set to tour extensively in 2017, supporting Cold War Kids on their U.S. tour and performing at SXSW and the Great Escape Festival.